The GeeDee Installer will automatically adjust the MS Windows OpLocks correctly for you. The following best practices are primarily for multi-user Paradox applications. If you're using a single user Paradox application, scan through these suggestions for applicable best practices. Also included are settings that are known to increase data speed with no-known negative stability effects and may contribute to increasing stability. Our position on this is that you can use Paradox tables safely and effectively but if your data is valuable to you, you may want to move it to a better data storage solution or at least make sure you have implemented robust backup and restore procedures and implemented the best practices in this online help. Paradox is a file based system and can be very fast. File based databases are still valuable and actively developed and marketed. For new SERVER INSTALLS at existing client sites DO NOT simply copy folders to new SERVER and hope that it works. Like all software products it requires installation. EXPECT ISSUES IF YOU IGNORE! For new SERVER INSTALLS at existing client sites please re-run the Workstation Installs on each GeeDee PC. This will update any required registry settings and more importantly it will perform a communications test back to the new server. EXPECT ISSUES IF YOU IGNORE! The following are minimum and recommended system requirements for GeeDee. We strongly suggest you meet or exceed the recommended requirements to ensure performance of your system is suitable for your agency operations. For a list of supported operating systems please refer to the information below. The requirements for memory and processors are indicative only and more RAM or disk space may be required when running GeeDee products in conjunction with other software. Please consult a qualified network technician to ensure that your network is adequately sized and tuned for the number of users and applications used by your agency. Internet access and Internet email available from at least one workstation. USB ports recommended. Operating systems not mentioned above are not supported. Network TCP Port 270 Broadcast must not be blocked and allowed on the network. These recommendations apply to all workstation operating systems. • Disabling of elaborate or complex (3D) screen savers if the computer is the ‘data server’ for GeeDee, as these can impact significantly on the performance of your software. • Optimise your virus scanner. Due to Microsoft discontinuing support for Windows 95, Windows 98, and Windows 2000, GeeDee is no longer able to offer support for our applications in these environments. Refer to http://windows.microsoft.com/en-AU/windows/products/lifecycle for Microsoft's Windows Desktop Product Lifecycle Guidelines. A server is not required if using GeeDee software as a standalone (that is, where the software is used on one machine only and installed on the local hard drive). Please consult the workstation requirements for stand-alone PC recommendations. GeeDee allows multiple operators to run the software concurrently on different computers all accessing the same database. The data may be located on either a peer server or a dedicated server. In peer server environments, the faster the peer server the better the performance for connected network users. For sites with more than 4 concurrent operators a dedicated server would be recommended depending on expected loads. If in doubt please contact GeeDee technical support to discuss further. • Cabling will impact significantly on the reliability and speed of your software. Ensure that the cable specification (UTP Cat 5, UTP Cat 5e, UTP Cat 6) is the appropriate type for the networking hardware installed. • For local area networks, we recommend investing in 100Mpbs hubs/switches and 100Mpbs network cards for fewer than 5 users. When increasing to 5+ users, we recommend using Gigabit switches. Remember that the faster your network speeds are, the faster GeeDee can process data. • We recommend that only necessary protocols are loaded on both the server and workstation. • Disable User Account Control (UAC). • IPsec (Internet Protocol Security) Severely impacts the data transfer and performance. • Using GeeDee on a wireless network, may severely impact the speed at which GeeDee can process data to and from the data source. This is dependent on the speed of the network connection and the reliability of connectivity. Wireless networks are prone to drop outs and will be problematic for ALL database applications across a network, not just GeeDee. • Using GeeDee on a WAN, will severely impact the speed at which GeeDee can process data to and from the data source. Ensure all Operating Systems have the latest Service Pack installed. It is recommended that if you are using a Terminal Server in your environment, that you put the GDMS data on that Terminal Server. The processing speeds will be faster as you are taking the network out of the equation. • Install enough processing power, RAM and hard disk space in your server to cater for all applications and services that are being run. These requirements may vary depending on the number of users on the system, applications running and level of usage. Consult your network technician for more details. • Ensure that you have offline backup capability that is used on a regular basis – backup should be at least weekly, preferably daily. • Disabling of any elaborate or complex (3D) screen savers, as these can impact significantly on the performance of your software. • Optimise your virus scanner. See Antivirus Exclusions. • Ensure that you have offline backup capability that is used on a regular basis – daily at minimum. • GeeDee follows Microsoft’s product lifecycles. If Microsoft has discontinued support, so has GeeDee Realty Systems. Refer to http://www.microsoft.com/windows/lifecycle.asp for Microsoft's Windows Desktop and Server Product Lifecycle Guidelines. GeeDee operates with most standard printers that are supported by your operating system. The amount of Random Access Memory (RAM) in your workstations has a major impact on the speed of your software. The more RAM in your workstations, generally the better your software will perform - and the more productive you will be. This applies especially for the latest operating systems. • The operating system you are using. • The software applications you are using concurrently, e.g. Microsoft Outlook, Word and Excel, GeeDee software and any other software. The more applications you are using, the more memory you will need. • The amount of GeeDee data and the size and complexity of files in MS Word or Excel, etc. The GeeDee database must be located on a supported Windows operating system. GeeDee now incorporates features that relies on Windows. Historically support for other file locking protocols such as NAS Devices, Linux and Macintosh (for example) have proven to be restrictive and time consuming. In many instances we are not able to run our required support tools or support the latest features. *We may also ask for the GeeDee Database to be relocated to a supported Windows operating system before providing support. Should be up to date and may need to be disabled or uninstalled during network testing. We recommend disabling aggressive modes such as Heuristic Scanning, it is important that you learn about how your Antivirus effects your environment. The following areas should be excluded from Real time scanning on all servers and workstations using GeeDee, to ensure this has taken effect we highly recommend checking the GeeDee Database folders by running the section “Monitoring processes using Windows Sysinternals - Process Monitor”. • GEEDEE Database Share on the server, disable scanning of mapped drives or network shares. • GEEDEE Program folders - See Link here for full Antivirus Exclusions. • Windows Print Spool directory may also need to be excluded. • Sufficient windows user permissions (MODIFY) to the GEEDEE Database Share and local Program folder (IE: C:\GEEDEE). Ensure adequate permissions are setup on the Share tab as well as the Security tab. 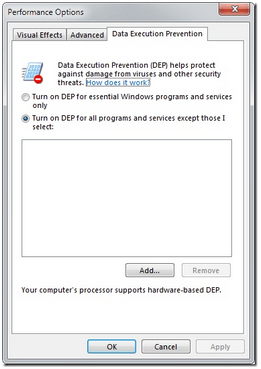 • Exclude GEEDEE EXEs in the Data Execution Prevention (DEP) List. • Ensure the connection is wired using Cat5 / Cat6 cabling standards, connections over WIFI or VPN are not supported by GeeDee. • Ensure the link speed is at least 100Mbit and that TCP/IPv4 is the only protocol in use (IE: Disable TCP/IP v6). **For Domain Controllers or Exchange Servers we recommend TCP/IP v6 is left as default. • Ensure the computer is only connected to one physical network. • Check the type of network card installed on the computer, confirm the correct drivers are installed. • Under connection properties, disable all power management options to remove control from other programs. • If running DHCP check how often new TCP/IP addresses are allocated or better yet set to static for easy control. • Optimise for High Performance. • Disable items such as hibernation, turning off HDD and Network cards etc. • Confirm the computer clocks are synchronised to the same time source and within a few seconds of each other. • Confirm the computer has all of the current Microsoft Updates installed. • Turn off Disk Compression to optimise disk I/O performance. • Disable Outlook Security Warnings (Programmatic Access Security settings). Setup under System Setup > Email/SMS > SMTP Server. • At this stage there is no provisioning for authentication, the email server needs to be setup to Relay, generally by allowing all of the GEEDEE Workstations by Hostname or IP. • Sent Items Email Address is essentially a BCC address, enter an external email address when testing to ensure Relay is allowed externally. • Many GEEDEE users will use their ISP’s SMTP server (IE: smtp.telstrabusiness.com), please ensure any 3rd party SMTP servers are setup to allow bulk email, some GEEDEE users send out 100’s of emails at once which can be halted by SMTP spam filters. Put your data tables on a real file server. If your application is a multi-user application and your data is worth at least $500, buy a file server and put your data on it. Do not use an existing workstation. Opportunistic locks (OpLocks) are a feature of the LAN Manager networking protocol implemented in the 32-Bit versions of Windows. An OpLock is a guarantee made by the server for a shared logical volume to its clients. These guarantees inform the client that the file server will not allow another client to change the content of the file, or if some change is imminent, the client will be notified before the change is allowed to proceed. OpLocks are an additional protocol on top of the file-system locking protocol and was implemented for performance reasons. • known problems with file-based databases such as MS Access. Our current recommendation is that if you're having problems now with Paradox tables, disable OpLocks on the file server. In addition, if you are not having problems now but you wish to take a conservative approach, disable OpLocks. Vista/Server 2008 Note: OpLocks changed with Vista and Server 2008. Microsoft introduced SMB2. I do not know if OpLocks still causes problems under a Vista to Server 2008 scenario or a 2000/XP to Server 2008 scenario. I do know if you disable OpLocks on Vista, the offline files feature fails. However, since we are recommending turning off OpLocks on the file server only (prevents all OpLocks), this is less of an issue. However, this begs the question, if I switch out my file server for a Server 2008 file server, are OpLocks still a problem? If anyone has information on this, let me know and I'll update this article. Some users get used to the idea of just turning off a computer at the end of the day without properly shutting down. Although it is fairly common knowledge that you must shut down your computer properly make sure all users understand that when working with live data on a network, it's critical. If you have a workstation that freezes up (crashes) every now and then, don't ignore it, resolve the issue. Your goal is to have stable well-running workstations that never crash. Please following best practices in order to maximize reliability and to increase speed where reliability does not suffer. Whether or not the BDE files are stored on the network or on each workstation, the BDE runs on each workstation so these best practices are also workstation best practices. We recommend using the latest BDE available, currently BDE 5.2.0.2. "The BDE is still shipping with products in 2010 including Delphi and C#Builder 2010." I have heard that MS recommends it be turned off if using their desktop database Access, and have found what seems to be the source of that. Also, almost everyone else seems to agree it is wise to disable them. Microsoft has discovered an issue where opportunistic locking can increase the risk of Jet database corruption when the file is shared by two or more clients on a network file server. This issue applies to Microsoft Windows NT 4.0, Microsoft Windows 2000, and Novell file servers that support opportunistic locking. This issue also applies to clients that are running Microsoft Windows NT 4.0, Microsoft Windows 2000, or Microsoft Windows XP, and that connect to a file server that supports opportunistic locking." InteGeeDeeing title: "Client Programs Stop Responding While They Wait for File Locking to Occur"
This is a Microsoft pubic access support thread on the topic. Quite a few references to various MS and other documents on the subject. "Windows oplocks is a lightweight performance-enhancing feature. It is not a robust and reliable protocol. Every implementation of oplocks should be evaluated as a trade-off between perceived performance and reliability. Reliability decreases as each successive rule above is not enforced. Consider a share with oplocks enabled, over a wide-area network, to a client on a South Pacific atoll, on a high-availability server, serving a mission-critical multiuser corporate database during a tropical storm. This configuration will likely encounter problems with oplocks." * block clients from performing their operations immediately. In practice the oplocks introduced by Microsoft are good enough when it comes to sharing files like Word documents or Excel spreadsheets in a networking environment. But they fail when it comes to heavy concurrency in environments with file-based databases such as Xbase++, Visual FoxPro and even MS-Access or VB applications with the Jet-Engine. There are other strategies available, such as the ones implemented with the file-system which deal with the problem of distributed caches in a network, but for whatever reason Microsoft has decided to go their own route. This document was prepared to assist GeeDee users who intend to use GeeDee Realty Systems in a Microsoft® Windows® 2003 / 2008 / 2001 / 2012 Server environment. The following instructions will not detail steps on how to setup your network or Terminal Services - it’s expected that the user is already capable of logging onto the server using a Thin Client session. For more information please see the various documentations available with your operating system or the system administrator. GeeDee users must be setup as part of the Administrators/Power Users Group on the server, to have the operating system rights to write to the registry keys and be able to use GeeDee correctly. GeeDee and Terminal Services has only been tested on a local area network using Microsoft® Remote Desktop Connection. Citrix connections are known to work but may require additional configuration by the Citrix Administrator. When installing an application on a Terminal Server, because multiple people will be using the application at once, there is actually a special method that you should use to install the applications. Here’s two methods to do it the right way. Now you can simply go through the next, next, finish style wizard which will help you get the application installed. Why Must I Do This? When you use “change user /install” before installing an application, you actually create .ini files for the application in the system directory. These files are used as master copies for user-specific .ini files. After installing the application, when you type “change user /execute” you are reverting to standard .ini file mapping. The first time you run the application, it searches the home directory for its .ini files. If the .ini files are not found in the home directory, but are found in the system directory, Terminal Services copies the .ini files to the home directory, ensuring that each user has a unique copy of the application .ini files. Each user should have a unique copy of the .ini files for an application. This prevents instances where different users might have incompatible application configurations. 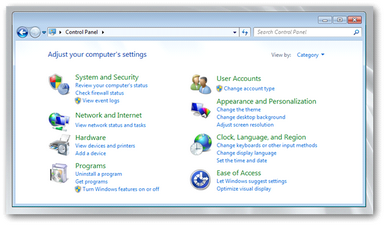 Install GeeDee using the Add/Remove Programs available in the Windows control panel. 2. Click the Windows Start button and choose Settings then Control Panel. 3. Double Click on the Add/Remove Programs icon. 4. Click on the Add New Programs icon then choose the CD or Floppy button. 5. In the Run Installation Program wizard choose the Browse button. 6. Navigate to the setup application D:\SetupGD.exe. 7. Highlight Setup then click Open and Next. Follow the installation instructions provided in user install guide to conclude the installation. 8. Once the installation has completed, reboot the server. 1. Login as the Windows Administrator. b. Under the "security information section, click on the Configure IE ESC" link c. Change status to OFF; click OK.
d. Turn off Windows Firewall and if you like you can add GeeDee executables (TCP and UDP) to firewall exclusion. You receive a message “User session is ready to install application”. 5. Once the installation has completed, reboot the server. GeeDee in now ready for use. It’s recommended to install Terminal services role before installing any application which will be available to terminal server users. If TS role installed after the applications are installed, some the application may not work correctly in a multiple user environment. In that scenario uninstalling and reinstalling the affected programs can resolve the issue. To ensure that an application is installed correctly to work in a multiple user environment, the Terminal Server must be switched into Install mode before applications are installed on the server. 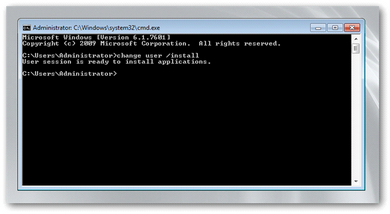 ++Using the Install Application on Terminal Server tool in Control Panel\Programs. This tool is available only when we install terminal server. 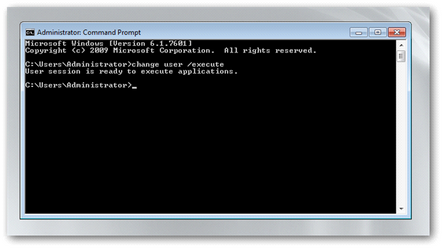 It will automatically put terminal server into execute mode when application installation is complete. ++ Run Change user /install from command promptto place the server into Install mode and install the application. After installing the application, use the Change user /execute command (or restart the server) to place the server back into Execute mode before using the application. Change user /query command can be used to find the current mode. This information is then circulated to HKEY_CURRENT_USER for each user when they log on to the Terminal Server.